Grain sustainable harvested from the Andean highlands in Peru. 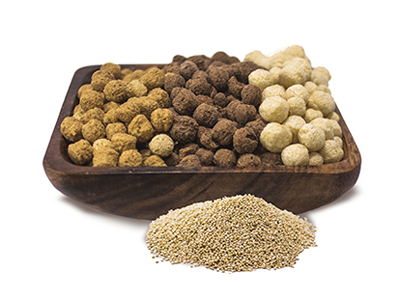 It is a nutritious and crunchy food made from organic whole quinoa grains that are cooked in a extruder to form a direct expanded puffed cereal. It can be natural or spray coated with natural delicious flavors. More than 15% complete plant based protein with all essential amino acids in an ideal balance. It is high in lysine an amino acid that is low in other grains. Natural source of dietary fiber, B-group vitamins, calcium, iron, magnesium and phosphorus. As direct consumption, it is ideal to eat with milk, yogurt or by itself. As a functional ingredient, it can be used in energy bars, muesli, snacks and mixtures with dried fruit. Also in a variety of presentations as dipped in chocolate, honey, etc. Great source of amino acids for muscle growth and repair. High in vitamins and minerals for good health maintenance. Natural and coated with cocoa, vanilla, whole cane sugar and other natural flavors. Organic and Conventional, Kosher, Vegan, Gluten-Free and GMO-Free. Free of additives, irradiation and BSE/TSE.